Balsa Man » Avoid Craigslist Scams! Looks like our previous post about counterfeit Balsa Man tickets don’t reach out to enough people. We’ve unfortunately found two people on craigslist who didn’t get the message and are looking for Balsa Man tickets. More alarming we ran across one scammer trying to hoodwink the small minded by selling an obvious counterfeit ticket (see photo). Also, in our search, we found someone looking for a ride to Balsa Man—we do recommend ride sharing. Remember folks THERE ARE NO BALSA MAN TICKETS. Balsa Man is purely DONOR SUPPORTED. 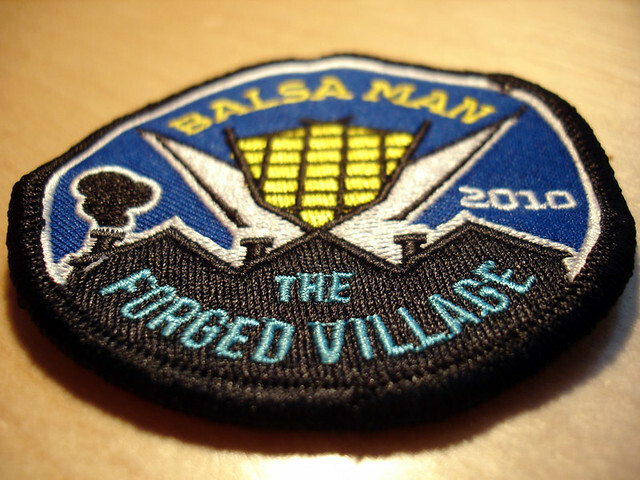 I know that the utter amazingness of the Balsa Man event can seem unbelievable at times. With all the hucksters online it’s hard to know what to believe these days. Every Tiny Artist who is awarded a grant is sent a letter of confirmation along with their grant award money and a gift of a Balsa Man sticker (see tiny art grants). Donations also pay for materials and supplies for Tiny Art Build Parties. The BPAF Art Grant budget relies on you the donor to support tiny art. The more you donate the more tiny art we can support! Remember last year there was such a high demand for patches that we ran out a couple weeks prior to the event. This year, we made more swank limited edition patches but we still expect to run out and once they run out we won’t make any more. So to get yours donate today! Tonight, the BPAF will be mailing out all art grant awards and the gift packages to all the donors who’ve given thus far. If you donate today your gift package will be included in this shipment; next shipment won’t be until next week. Also, if I give someone a ride to Balsa Man, do I just take them 1/16 the way there?